Published on March 16, 2016. First up, some news in monitoring marketing to children. More candy marketers are joining up in self-regulating how they market to kids. On Wednesday, the Council of Better Business Bureaus and the National Confectioners Association announced the Children's Confection Advertising Initiative. Companies participating in CCAI agree to not advertise directly to children under age 12. The six charter companies are Ferrara Candy Co.; Ghirardelli Chocolate Co.; Jelly Belly Candy Co.; Just Born Quality Confections; The Promotion in Motion Companies Inc.; and R.M. Palmer Co. The CCAI is modeled after the Children's Food and Beverage Advertising Initiative (CFBAI), another CBBB-administered program with major candy makers as participants: American Licorice Company; Ferrero USA; Hershey Co.; Mars Inc.; Mondelez International; and Nestlé. "CCAI follows the same principles as CFBAI, but is designed for small-to-medium size confectionery companies and has fewer administrative requirements than CFBAI," Maureen Enright, director of CCAI and deputy director of CFBAI, said in a statement. "All CCAI participants are making the same commitment -- to not engage in child-directed advertising." More campaigns are focusing on digital elements as marketers try to truly target their target audiences. 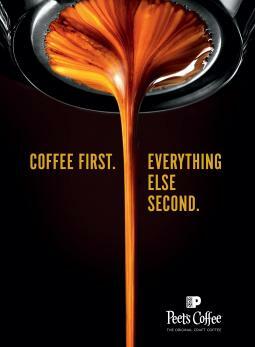 Peet's Coffee and Tea's new "Coffee First, Everything Else Second" campaign is primarily digital and also includes the coffee chain's first print advertising. The Cutwater work breaks Wednesday and will build up to and beyond Peet's 50th anniversary on April 1. The detailed photography and other elements try to truly establish Peet's "as the original craft coffee in the U.S." and will run through the end of May, according to Andrea Fernandes, director, brand marketing. Expect to see Peet's first print ads in the April issue of Bon Appetit, the March 27 issue of the New York Times Sunday Magazine and the March 28 issue of The New Yorker. Print is a smaller element at about 30% of the media mix, with digital and social accounting for 50%. 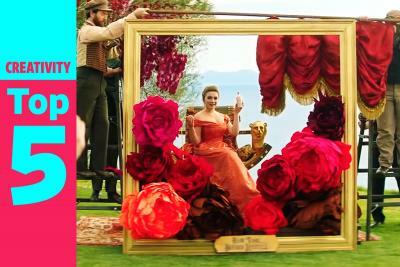 The digital campaign includes 15-second spots. A more humorous approach, including hooking up a Peet's barista and a roaster to a polygraph, will also be used in a #NoFooling push that will begin in late March and carry over through chain's 50th anniversary on April Fool's Day. Meanwhile, Jimmy Dean Delights began airing "Morning Swap" videos to underscore its use of real ingredients in the frozen breakfast items, a shift away from an earlier focus on the number of calories in the lighter line. The Tyson Foods brand had a farmer and a mother swap spots in the spots from Ogilvy & Mather. One of three shorter takes focuses on the mom working on gathering eggs at the farm while the farmer runs her errands. A longer form video shows more of the swap. The videos are popping up as YouTube pre-roll, as well as on Facebook and Instagram. One way to make a lot of noise at your first South By Southwest appearance is to build the world's largest interactive DJ controller and have musical performances by acts like The Roots and Big Grams. That's what Bud Light did. 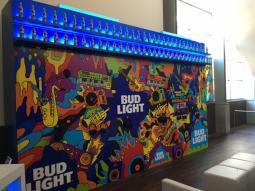 The beer brand built a 50-foot-long wall that featured instruments, art and letters that all make different sounds when touched. The idea is to have multiple people touch different parts of the wall to create music. 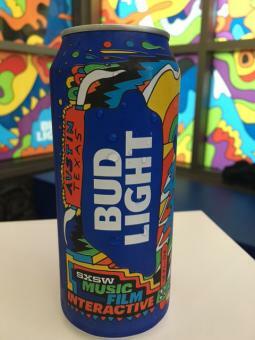 "It makes a can't-miss statement inside the convention center that gives consumers the power to remix popular music live, in collaboration with each other," said Alexander Lambrecht, VP, Bud Light. The brand also gave out SXSW-themed cans. Here's something you don't see often on TV, particularly during March Madness: Ads for ladders. But it makes a lot of sense for the Werner Podium, the official ladder of the NCAA Basketball Championships. It has an extra-large platform and guardrail at top, so it's ideally suited for stability during tasks like cutting down nets after big basketball victories. The 60-second ad from Saturn Lounge, a commercial photography and video production studio based in Milwaukee, began airing on CBS Sports Network recently and will also air during NCAA championship broadcasts starting this week. It features American Ultimate Disc League player and trick-shot artist Brodie Smith doing some pretty remarkable stunts involving a flying disk, ladders and, of course, basketball nets. 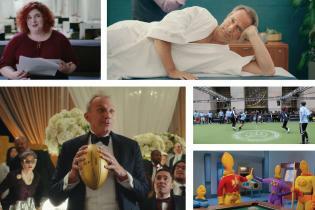 During Tuesday night's NCAA games HY Connect debuted a campaign called "You Know Your Business Better" targeting small businesses for Chicago-based MB Financial. It's the agency's first work since winning the account last spring. A spot featuring a business owner explaining the ins and outs of his company to a bank executive will run in the Chicago area. MB Financial spent over $600,000 on measured media in the U.S. last year, according to Kantar Media. Of course, restaurants are also doing what they can to get in on the March Madness craze. Buffalo Wild Wings added Snapchat geo-filters, Facebook postcards and updates to its website to envision the restaurant as the place for a "sports-cation" during the tournament. Pizza Hut's approach for its WingStreet chicken wings, however, focuses on in-home eating. WingStreet orders placed Thursday will come with a custom bag good for free dry cleaning of one pair of pants. 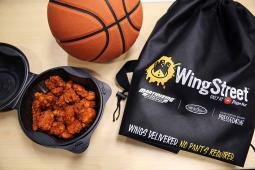 The promotion is meant to underscore WingStreet's "No Pants Required" tagline and remind basketball fans they don't have to go out (or even put on pants) to get wings. WingStreet expects to sell 68 million wings this week through the Final Four. The deal is being run with Martinizing Delivers and its sister brands, 1-800-DRYCLEAN and Pressed4Time. Switching to a different kind of apparel, Edelman wants its new interns to walk in the agency's shoes -- or at least design them. The PR shop has teamed with Chicago shoe retailer BucketFeet for a competition in which candidates will be asked to create a shoe design that "tells a compelling story based on the given brief." They must use provided art supplies. Winners receive a paid creative design internship at Edelman's Chicago office, and will also get the chance to have their shoe made and sold at BucketFeet. The retailer sells shoes that are designed using an ongoing open call for artwork. Designs have been pulled from more than 20,000 artists across 100 countries. 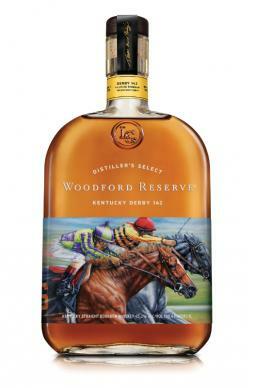 Woodford Reserve is marking its status as the official bourbon of the Kentucky Derby with a commemorative bottle designed by Chicago artist Thomas Allen Pauly, who has been painting horses and jockeys since 1978. This year's bottle art is called "Barreling Down" and shows two thoroughbreds and jockeys neck-and-neck. For fans of another sport, T-Mobile is giving customers a year's subscription to MLB.TV Premium as part of its renewed sponsorship deal with Major League Baseball. The live streaming service shows out-of-market regular season games that T-Mobile customers can watch on their mobile devices. The wireless marketer estimated the value at $109.99. The sponsorship was renewed for three years and includes the title sponsorship of MLB's Home Run Derby during All-Star Week. 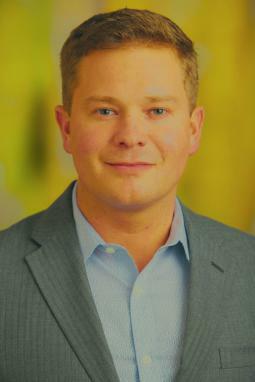 Advantage Solutions has hired Procter & Gamble Co. associate marketing director Nick Patterson as senior VP-marketing and sales. 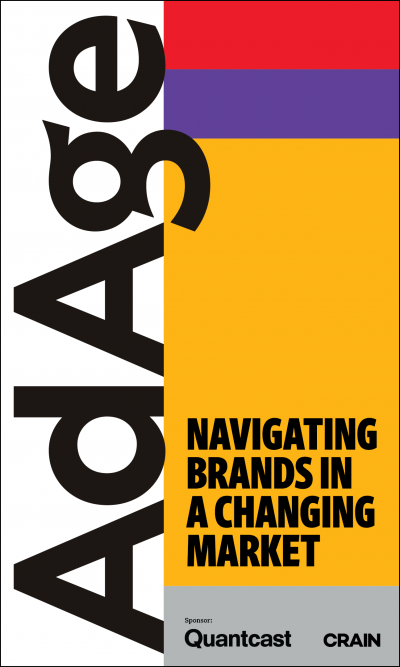 Owned by Leonard Green Partners and The CVC Group, Advantage does $2 billion in sales, with its Advantage Marketing Partners unit listed by Advertising Age as the top U.S. marketing promotions and experiential marketing company. Mr. Patterson's role also covers Advantage Sales, the largest sales brokerage firm in North America. During his 13 years at P&G, Mr. Patterson spent five years on the Walmart customer team and one year on loan to Walmart as marketing director in their new business development group. He later came back to the U.S. as Old Spice brand manager, part of the team behind the "Man Your Man Could Smell Like" ads and co-winner of P&G's internal Biggest Brand Turnaround Award. He spent his past five years on Gillette, focused on emerging markets, then retail teams for the club and home-improvement channels. Mr. Patterson's appointment follows Kevin George late last year becoming president and CMO of Acosta Marketing Group, a key Advantage rival. Mr. George, who had been CMO of Beam Suntory, was previously part of Unilever's Axe team -- so the deodorant wars are getting a second act in the world of shopper and experiential marketing.